It is always pleasantly surprising when serendipity throws up a little treasure for a musicologist, even when it is a well known cultural artefact. Recently my attention was drawn to the wonderful panel (painting) by Gentile da Fabriano (1370–1427), The Coronation of the Virgin, now owned by the Getty Museum, Los Angeles. The Getty has provided an open-access, high resolution reproduction of this astonishing example of late medieval art which gleams with gold and textured surfaces (all the techniques that the next generation of renaissance artists eschewed). The panel shows the Virgin Mary being crowned as the Queen of Heaven by Christ. The dove hovering above the Virgin’s head represents the Holy Spirit. So, after recovering from the eye-boggling sheer beauty of this piece, I noticed that the choir of angels on either side of the lower half of the panel were holding rolls on which musical notation appears. The music notation is of the type found in choir books of liturgical plainchant from the late thirteenth-century onwards, developed by Dominican and Franciscan reformers whose religious orders brought about fundamental transformations in the natural and notation of plainchant after their founding the early thirteenth century. The question that immediately came to mind was whether the notated music was a known piece of music. There are two primary leads that a musicologist might pursue in trying to discover the identity of a piece of what is clearly vocal (i.e. sung) music. There is the music notation itself; and there is the sung text. (Listening and memory of music heard/sung also plays a role, but more on that another time.) Sometimes it is easier to discover the identity of a piece of liturgical chant firstly by identifying its text, although the same text can often have more than one musical setting. So a quick text search with Google using a few advanced techniques soon revealed that the portions of text shown in the two rolls of music come from a text that St Francis of Assisi, the founder of the Franciscans, composed from snippets of Biblical passages, and which is known as the Exhortatio ad Laudem Dei or the “Exhortation to the Praise of God”. The text of the Exhortatio is shown below, with the bold text indicating the portions that can be found in Gentile’s painting (bracketed text refers to the Biblical origin of each verse). That both verses from the Book of Revelations (Apoc) appear here in the same order as in St Francis’s Exhortatio (the later one first), and that Gentile paints them as though they are part of a more extensive text would support my conclusion that this is a reference to St Francis’s text. So what about the music, Mr Music Historian? One of the most useful online research tools for chant researchers to emerge in the last few years is the Global Database of Chant developed by web app genius and musicologist Jan Koláček. A great feature of the Global Chant Database, which draws together data for existing indices of chant melodies and continues to add new material, is the melodic search tool which you can use to find a particular melodic phrase from a chant. Entering the first nine melodic pitches that appear above the words “Timite dominum” (on left) produced three hits: two related hymns In caelesti collegio novus and In caelesti collegio novus, and a rare and late antiphon Proles de caelo prodiit novis. Both hymns (In caelesti and Proles) are sung for the feast of St Francis of Assisi, and have almost identical melodies in their respective indices (see the Global Chant Database for details on these indices). The antiphon was sung for the Office of St Benedict and its melody is quite different to the hymns after the first 10 notes. But there’s a catch. Gentile’s melody begins in Gregorian chant Mode 1 (the one with a D final and whose range is mostly above that note); known sources transmit the hymns and antiphon in Mode 3 (E final, high range). This need not be the end of the matter since so long as a chant avoids the second degree of a mode (which is tone above the final in Mode 1 and a semitone above the final in Mode 3) and uses a B flat, a Mode 3 melody can be easily rewritten or transposed down to a Mode 1 melody. Whether this happened frequently, however, is another matter that requires further research. 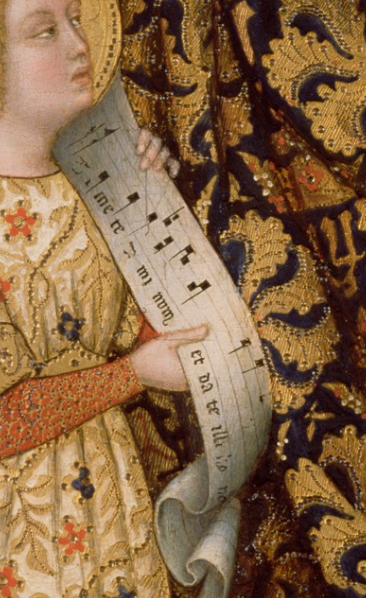 Unfortunately, the melodic fragment in the music roll held by the angels on the right does not correspond to the melodies of either hymn or the antiphon in any easily recognisable way. Nor does this melody score any hits for the chants stored on the Global Chant Database. This suggests several possibilities. Either the melody that Gentile painted in his panel remains unknown or is lost; or Gentile simply made up the melody (suggesting he or one of his apprentices knew enough about music and music notation to produce a fairly convincing resemblance to at least one well known chant; or that Gentile (or his apprentice) painted a melody that was transmitted orally to which the Exhortatio ad Laudem Dei was sung. Each of these is a possibility, although exploring them in extensio is an exercise that will have to wait until time and possibly another forum. But the curious association of St Francis’s Exhortatio with a hymn to the same saint raises some curious possibilities, especially concerning a lost (oral) tradition. Art historians generally agreed that Gentile painted the Getty Coronation of the Virgin for his home town of Fabriano around 1420, after he had left Brescia in 1419 and before arriving at Florence c. 1422 (Christiansen 1978/9:8). In its original form, the other side of the panel featured the Stigmatisation of St Francis. This side of the panel was split off in the 19th century, and is now in the Magnani-Rocca collection in Reggio Emilia (Allen 2003: 15). The two-sided panel would have been used in processions in Fabriano: it originally had attachments to allow it to be hoisted up as a processional standard (Christiansen 1978/9:10). It seems clear from documentation and the art-historical evidence that this panel was painted for the church of Saint Francis and its Franciscan monks at Fabriano. The use of St Francis’s Exhortatio and the possible reference to one or more of the hymns sung in his honour provides further evidence for this conclusion. One final remark needs to be made before I finish. This is not the only instance that Gentile painted angels singing from notation to the Virgin. Each version of his Enthroned Madonna with Child and Angels—one is in the Galleria Nazionale dell’Umbria at Perugia, the other in the Metropolitan Art Museum at New York, both possibly painted while Gentile was a resident of Venice—depict a rank of angels at the virgin’s feet singing from a roll of music notation. There is little difficulty in determining the music that Gentile paints: it is the Marian antiphon Regina caeli laetare sung at Compline (click on the previous link to listen to a recording of this chant), especially on Sundays (Billiet 2008, 126). Both panels predate the Getty Coronation of the Virgin by a decade or more, and illustrate Gentile’s continued use of a rather conventional device to represent singing visually in a painting. Gentile clearly went to considerable trouble to paint the square neumes (the types of notes used in contemporary Gregorian chant sources) carefully in both instances: apart from portions where the angels obscure the notation, it is relatively easy to recognise the traditional solemn melody. (There are some interesting differences in how neumes are formed). This leads me to suspect that the melody in the Getty Coronation of the Virgin is in fact a lost (or as yet unknown) music setting, perhaps part of an oral tradition, of St Francis’s Exhoratio ad Laudem Dei. Do you know the chant or melody shown in Gentile’s Coronation of the Virgin? Do you know of a discussion of this same melody in published literature? I would be most grateful for any responses to these two questions – please leave any responses as a comment to this post! – Billiet, Frédéric. 2008. “Entendre le concert céleste dans oeuvres de Gentile.” In Il mondo cortese di Gentile da Fabriano e l’immaginario musicale: La cultura musicale e artistica nel Quattrocento europeo e la sua riscoperta in epoca moderna e contemporanea, ed. Mara Lacchè, 104–127. Rome: ARACNE. Thank you, Jason! I love it!